Hundreds of seniors gathered May 10 at the Masonic Village in Burlington Township for the 19th annual Burlington County Senior Expo. The event featured dozens of tables with information about programs and services for seniors. There are about 72,000 seniors living in Burlington County. 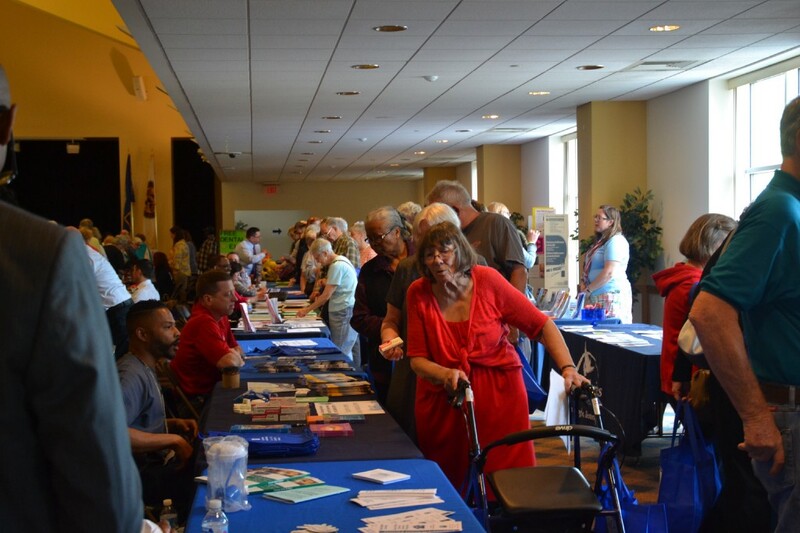 Hundreds of them gathered May 10 at the Masonic Village in Burlington Township for the county’s 19th annual Senior Expo to learn about programs and services available to local seniors. “It gets bigger and bigger every year,” Burlington County Freeholder Director Kate Gibbs said. Dozens of vendors participated in the expo, including the Burlington County Animal Shelter. Residents over the age of 60 can adopt animals from the shelter for free. In addition, Anderson said residents of any age can adopt a “senior” dog or cat over 10 years old for free. Taking in an older pet is a good adoption opportunity for older people, she said. “We’ve had seniors who are afraid of getting an animal that will outlive them,” Anderson said. Other tables at the expo featured information on area nonprofit organizations and county, state and federal agencies. The first 500 seniors to arrive at the event received a tote bag to fill with brochures and other documents. “It’s something that the seniors look forward to every year,” she added. Barbara Winiarski spoke to attendees about life after their spouse or partner has died. She’s the community outreach director for the nonprofit H.O.P.E., which stands for Helping Other People Evolve. “We’re the only organization in the area that has support groups run by people who have been widowed themselves that are trained,” Winiarski said. H.O.P.E operates a number of support groups that meet regularly in Burlington County, including in Marlton and Moorestown. Winiarski said the groups allow people who may be lonely after the loss of a loved one to build some camaraderie with people who have undergone similar experiences. “Some people can be married 40, 50 years and then they’re alone,” she added. For more information on H.O.P.E., call (856) 234–2200 or visit the organization’s website at www.hopesnj.org. The Senior Expo was hosted by the Burlington County Sheriff’s Department and the county’s Board of Freeholders.